Microsoft's Internet Explorer is regularly targeted by malicious users, some say it is because the web browser is inherently insecure while others link the attacks to the market share of the browser. Computer users who work with Internet Explorer can increase the security of the web browser with a few simply configuration changes. The following guide explains how to make changes to the security zones in Internet Explorer to improve the security on the Internet. Internet Explorer uses different settings for each of its four security zones. The Internet zone is the standard zone. The settings of this zone are used unless the sites are listed in the trusted sites or restricted sites zones, or if the website is hosted on the local Intranet. The general idea is the following: Increase the security level of the Internet zone, and add trusted websites and services that require scripts that are blocked in that zone to the trusted sites listing so that they execute normally. 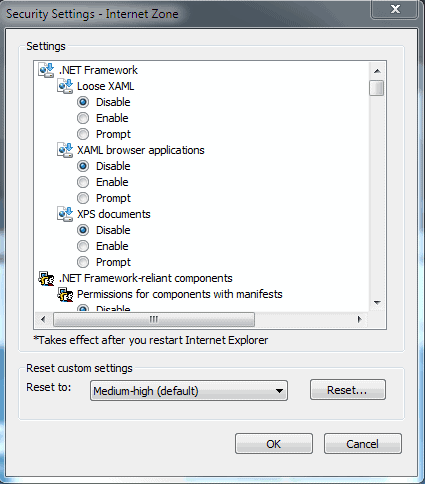 The Internet Options can be opened in Internet Explorer by clicking on Tools > Internet Options. They are also available in the Windows Control Panel under the Network and Internet category (in Windows 7, might differ slightly in other Microsoft operating systems). The Security tab lists the four zones and their security levels. Start by changing the slider of the Internet zone to high. You may need to click on Default level first before the slide is shown. High ensures maximum safeguards and that some features are disabled. Adding those sites to the list of Trusted Sites in the Internet Options of Internet Explorer ensures that all their contents and features can be used just like before. The standard security level of the trusted zone is set to Medium. To add sites to the Trusted sites click on the Trusted Sites icon in the security tab and the on the Sites button. Standard websites can only be added if the checkmark is removed from "Require server verification (https:) for all sites in this zone. Internet Explorer will automatically suggest the site in the active tab for inclusion, other sites can be entered manually. The settings can be tested immediately. Trusted sites are indicated in the status bar of the web browser. Advanced users can select a custom security level for both the Internet zone and the Trusted sites zone. This does require knowledge of web technologies or research to find out what a specific setting does. It is for example possible to increase the security of the trusted sites zone as well, by disabling features that are not needed. Do you have other Internet Explorer security tips? Let us know in the comments. Great post, an excellent walk through for IE users! > Do you have other Internet Explorer security tips? People would be better to consider the many alternative browsers and dump IE.